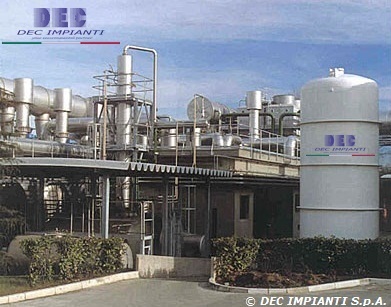 DEC IMPIANTI is offering several decades of experience in design and installation of the most technically advanced and efficient vapor phase solvent recovery systems, also dedicated to the succesful recovery of problematic solvents such as ketones (particularly MEK - methylethylketone). The spontaneous ignition of the activated carbon, when dealing with problematic solvents (i.e. ketones such as methyl ethyl ketone, cyclohexanone, etc. ), could lead to severe damages to the solvent recovery plant: the activated carbon, acting as a catalyst, is supporting oxidation reactions, which are strongly exothermic. Furthermore, the resulting formation of high boilings acids (i.e. adipic acid from cyclohexanone) may lead to efficiency problems, due to the high requested desorption temperature (carbon fouling). In order to prevent, detect and suppress such undesired side reactions, we have developed (since 1993) the DEC.FPDS™ process control module, which is available with different layers of configuration, from the basic "phase 1" to the most advanced configuration "phase 4". Adavanced temperature monitoring system, assisted by CO and CO2 advanced N.D.I.R. (nondispersive infrared) analyzers, coupled with our DEC.ODP™ (Oxygen Depleting Process), will increase both passive and active safety of your solvent recovery system. In order to recover, with increased safety, the ketones, a particular design of the system shall also be adopted, typically involving increased capacity of SLA cooling (25 < Tads < 30 °C), possibly coupled with the DEC.RHC™ (Relative Humidity Control), and a particular type of adsorbent (activated carbon - i.e. acid washed, low ashes, etc.) shall be used.